Break it down: What is Binder Jetting? 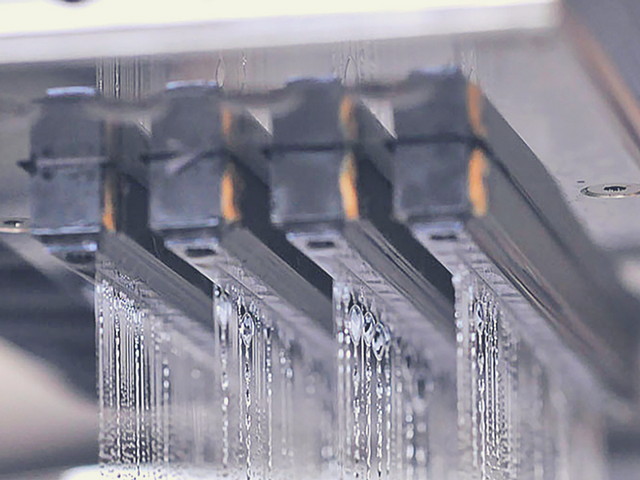 Binder Jetting is a generative production process when metal powder is moistened for a specific purpose by a liquid binding agent, binding it together. The print head applies the binder to the powder as required, then the next layer of powder is added. This process, involving one layer of powder and binder, is repeated until the component has been built up. With Binder Jetting, ther is no additional material consumption or post-processing by support structures necessary. The printing time is significantly shorter than with laser-based 3D printing processes. Since no building panel is necessary, several parts can be made on top of one another in the same print process, which increases productivity compared to laser machines. As the parts do not have to be “welded” using laser energy, a completely different structure is created. This results in the part having different - and improved - mechanical and physical characteristics. The process enables particularly fine types of metal powder to be processed, which typically would need to be processed by Metal Injection Moulding (MIM). When using laser technologies, only weldable metal powder can be used. Binder Jetting technology makes it possible to use any type of powder, which can be bonded with binders and sintered.